For information on setting up dialing with Salesforce CRM, please click here. This page will guide you through configuration and basic use of the Level365 CRM Connect Salesforce CRM Add-in. Right-click the Level365 CRM Connect tray icon in the system tray menu and then left-click the Configuration option from the menu that pops up. This will open the 'Configuration' screen. In the 'Integration' area, click the Add new button, select Salesforce CRM from the 'Type' drop-down box and then click the Set button. Salesforce CRM uses an additional security measure called a security token which needs to be added to the end of your password. For example, if your password is 'mypassword' and your security token is 'XYZ123', you should type 'mypasswordXYZ123' into the 'Password' box. If you're not sure what your security token is, you can reset it by first logging into your Salesforce CRM account. Then go into your name account's 'Settings' page by clicking the option near the top-right corner. Then, in the 'My Personal Information' group of settings, click on the link that says Reset your security token and follow the instructions on the page that is loaded. Your new security token will be sent to your registered email address. If your Salesforce account has a domain, go straight to 'Creating a connected APP'. 1. Log into your Salesforce account, and open the Setup menu. Search for 'Domains' in the Quick Find Box, then select My Domains. 2. Enter the Domain Name you want to use, and press check availability, and then register. 3. Your domain should be emailed to you shortly after. Log into your Salesforce account, and open the Setup menu. Click on Build > Create > Apps, then at the bottom of the page, under 'Connected Apps', click New. Enter a Connected App Name, API Name, and Email address for your app. Check the 'Enable OAuth Settings' option. Check 'Enable' for Device Flow. Uncheck 'Require Secret for Web Server Flow' option. Press save, followed by the Continue button. You will now see the Connected App definition-make note of your 'Consumer Key'. Allow from 2-10 minutes for your changes to take effect on the Salesforce.com server before using the connected app. 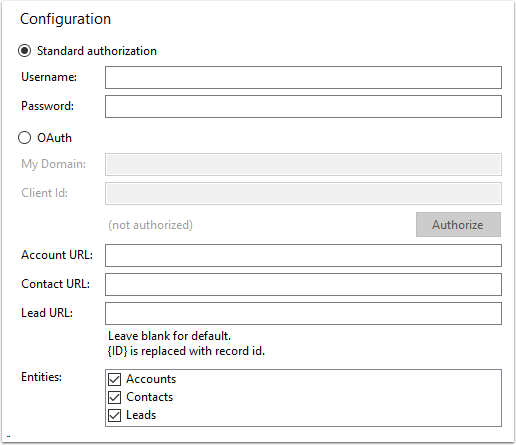 On the Level365 CRM Connect configuration, select 'OAuth', and paste in your Domain and Client ID (Consumer Key). Press Authorize. 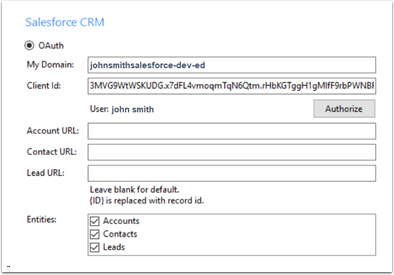 The domain you enter will be something like 'johnsmithsalesforce-dev-ed' if your Salesforce URL is 'https://johnsmithsalesforce-dev-ed.my.salesforce.com/'. Back on the Level365 CRM Connect 'Configuration' group, select which of your Salesforce CRM account modules you want to be used by checking the corresponding boxes in the 'Objects' section. 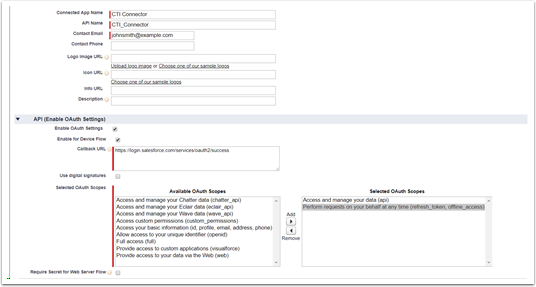 Under the heading 'Data Connection', check the box 'Create activity on call end' to automatically log the call activity to the contact in Salesforce CRM or, to manually log the call activity, check the box 'Show activities on Call'. When the caller's number is recognized within Salesforce CRM, this will present an additional button within the Level365 CRM Connect call preview window. Pressing this button will open an activity / note taking window in Salesforce CRM, pre-populated with important call details. To test if the configuration worked, enter a phone number from your Salesforce CRM account into the 'Telephone' box in the 'Integration test' area and click the Search button. The results will be displayed after a few seconds. The key here is "(407) Proxy Authentication Required". During the initial communications with Salesforce to authenticate, we expect a callback to the client. If this message does not get through your proxy server then it cannot authenticate. 2015-07-15T16:01:48 Salesforce CRM Load failed. Exception: The remote server returned an error: (407) Proxy Authentication Required. 2015-07-15T16:02:36 Salesforce CRM Search failed because not loaded.